With a moniker like Axehammer and cliché-ridden lyrics such as: “Like a shadow in the night/Looking for the morning light” it doesn’t take an excessively sharp mind to pidgeon-hole this music before even pressing ‘Play’. Yup, its old-school Metal grovelling in the wake of Manowar, early Jag Panzer, Steeler and other U.S. Metal contemporaries with hints from British luminaries such as Tank and Satan. One may argue that Axehammer themselves are contemporaries of the aforementioned bands since apparently they existed in some form or another since the early 1980s, although their debut full-length didn’t see the light of day until 2005. More importantly, third album “Marching On” is a convincing snapshot of the meat and potatoes of Metal. 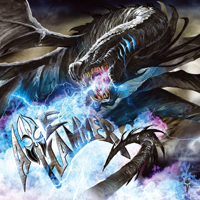 Ergo the listener is treated to incisive guitars, a tight-sounding rhythm section and Halford-esque vocals singing about dragons, bloodshed, courage and the eternal fight between good and evil. Can you get any more Metal than that? Axehammer frontman Kleber Mandrake gives a truly impressive performance and as a vocalist deserves to be rated up there with all the Halfords, Adams and Dickinsons. Curiously, there’s only one (excellent) guitarist within the line-up and I couldn’t help wondering if a dual-guitar approach would have given Axehammer’s music a more well-rounded sound. Musings apart, the superior quality of “Marching On” is undeniable. As a listening experience it’s enthusiastically recommended.